Amenity limitations - AC temperature may NOT be turned bellow 70 Fahrenheit.Otherwise permanent damage will be done/AC breakdown and or power outage to the whole apartment. The Air conditioning temperature may NOT be turned bellow 70 Fahrenheit. Otherwise damage will be done to the ac unit and may result in overload which will result in ac breakdown and permanent damage and or power outage to the whole apartment. This location is perfect! 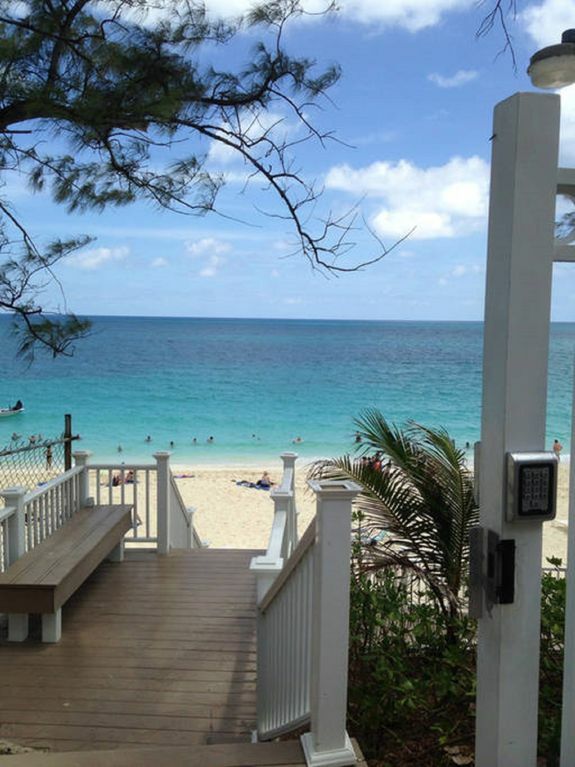 Two minute walk to gorgeous beach and ocean from this very nice one bedroom condo. Lovely pools with lush landscaping and a great restaurant, Viola's on site. Food was excellent! Owner of condo was very prompt in taking care of a few issues with faucets- they were fixed that day! Would recommend this place!! Hope to come back some day!! My girlfriend and I flew in from Toronto and wanted a place with that wasn’t crazy expensive, in a good location with access to the beach and it was perfect for us. We were able to arrange an airport pickup and drop off through the VRBO, which was a huge help, the driver Bert was extremely nice and helpful. The room was 2 floors which was nice, we didn’t spend much time in the room, but my only 2 comments are the water pressure was a little weak in the shower and sink but outside of that we loved it for our needs. Great pool, great beach front access and Voila’s restaurant was good and in the evenings there was always a good crowd. Because of the great location we were able to walk to the Ocean club for dinner one night and walk around Atlantis the other evening. If you are looking for a good location that is reasonably priced and close to everything but don’t mind being in a more rustic room, then this is the perfect place. We loved it and I would come back again. The bed as well as the folding couch were very compfortable for us party of four. The pool area and the cafe near by were great. The beach was gorgeous. Drinking water was provided for. I would have liked the apartment a bit more tidy in the sense of cleaning stuff etc beside the staircase and maybe a new coat of paint for the walls - but that was really just a minor issue. It was our pleasure to host you. We're glad our property met your expectations and you enjoyed your stay as this is always our #1 goal. We will surely be working on enhancing our services as we always want our guests to have a wonderful experience. Thanks for your kind review and we look forward to hosting you again. Really quaint complex beautiful pools and beautiful beach! Taxi cabs pricey no uber or transit but location fantastic lots of stores close by! Couch bed really comfortable for guests! Enjoyed it ! It was our pleasure to host you. We're glad you enjoyed your stay as this is always our #1 goal. Thanks for your kind review and we look forward to hosting you again. The location is great. Having access to the beach and the restaurant is an extra benefit. The villa was not especially clean with dirty tile grout, broken toilet seat, old cooking utensils and a rusty cooking stove. The bed is in need of replacement along with sheets that fit! Tangerine Dreams, the rental agency was good to work with. It was our pleasure to host you and we're thrilled you had an amazing experience. We will take not of your suggestions and keep improving on our amenities.Thanks for your kind words and taking the time to share it. We look forward to hosting you on your next visit. Tangerine Sunsets is Fabulous! - My husband and I had a wonderful stay here in Nassau, Bahamas. We were celebrating our 25th anniversary and were elated to have a cozy, clean, and safe place to stay. Being located over Paradise Island was a bonus as everything one could want to see and do was nearby. I definitely recommend staying here. It was our pleasure to host you and we're thrilled you had an amazing experience. Thanks for your kind words and taking the time to share it. We look forward to hosting you on your next visit.